DEAR MAYO CLINIC: How does vaping affect teen health? My high school children tell me it’s everywhere in their school, and not much is done to stop it because people are under the impression it’s not harmful. ANSWER: Using e-cigarettes — a practice often referred to as “vaping” — has been touted as a safe alternative to tobacco cigarettes. Although more research is needed to understand all the effects of vaping, it’s clear that vaping can negatively affect health. E-cigarettes are battery-operated devices that heat a liquid and turn it into an aerosol to be inhaled. The solutions in e-cigarettes typically contain vegetable glycerin or propylene glycol as the main ingredients, along with nicotine, flavorings and other additives. One of the primary concerns regarding e-cigarettes is that most contain nicotine — a highly addictive substance. Once you become dependent on nicotine, it’s extremely difficult to stop using it. Attempts to quit using nicotine can lead to various symptoms, such as strong cravings, anxiety, irritability, restlessness, difficulty concentrating, depressed mood, frustration, anger, increased hunger, insomnia, constipation or diarrhea. Studies have shown that long-term e-cigarette smokers are exposed to as much nicotine as individuals who smoke regular cigarettes. Nicotine dependence in teens and young adults is particularly concerning because when a person is younger than 25, the brain is still developing. Exposing a developing brain to an addictive drug such as nicotine can potentially lead to permanent alterations in brain chemistry. That can disrupt the growth of connections within the brain that control learning and attention. It also may make the brain more vulnerable to other forms of addiction in the future. At this point, the potential long-term effects of e-cigarette smoking — beyond nicotine addiction — have not been explored thoroughly. However, various short-term negative health consequences have been associated with vaping. One study found people who had smoked e-cigarettes for seven months experienced an increase in shortness of breath, cough and fevers. Cases of lipoid pneumonia associated with e-cigarette use have been reported. This inflammation of the lungs happens when fatty substances are inhaled into the lungs. Some e-cigarette vapor contains ingredients that could be toxic, including nickel, tin, lead, benzene and formaldehyde. 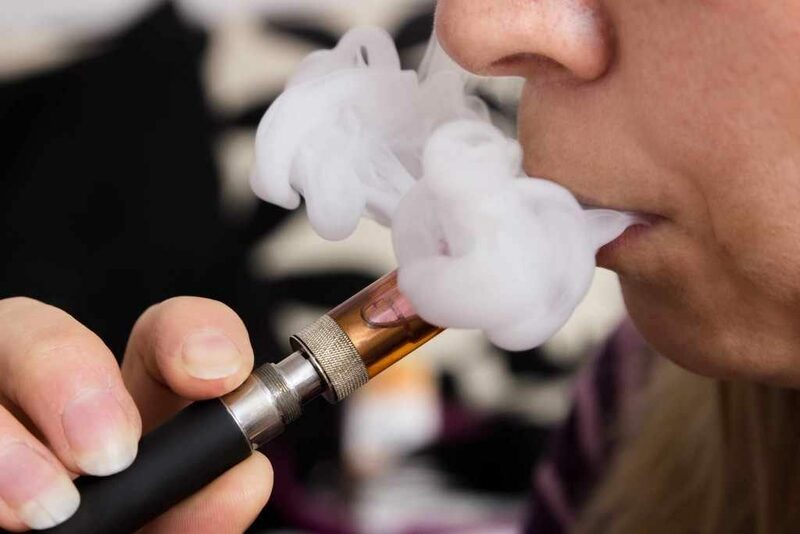 Long-term exposure to these substances in e-cigarette vapor could potentially lead to injury and disease, including cancer, and can affect reproductive health. Some people have touted e-cigarettes as a way to quit smoking. But studies have not shown e-cigarettes to be an effective way to stop smoking tobacco cigarettes compared to therapies approved by the Food and Drug Administration for smoking cessation, such as the nicotine patch. Another study reviewed research regarding the probability of adolescents and young adults starting to smoke tobacco cigarettes if they ever used e-cigarettes. Teens and young adults who had tried e-cigarettes had about 3½ times higher odds of smoking tobacco cigarettes than those who had never used e-cigarettes. It’s also important to note that e-cigarettes are not required to conform to consistent safety standards, and that can lead to serious concerns. There have been cases of e-cigarettes that have exploded and caused significant harm, including flame and chemical burns, as well as blast injuries.